Design Thinking to Focus, Collaborate, Play! 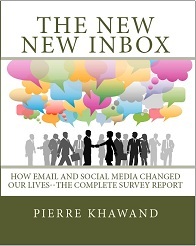 The New New Inbox was originated from the idea of the reflection on the use of e-mail and adoption of Social Media that continue to surge and reshape our work and personal lives. I designed this survey to explore further the impact that these platforms are having in the workplace and better qualify and quantify the underlying opportunities and challenges. The goal is to better understand the attitudes and behaviors of today’s workforce as it relates to the use of e-mail and Social Media in the workplace, and to understand how these attitudes and behaviors vary by generation, by personality type, by function, and by company size. The survey identifies the platforms that are most in use and to what degree. It also pinpoints the time spent on e-mail and Social Media and how much of this time is spent on personal versus work-related activities. It also examines the tools that business professionals use to manage these platforms. Most importantly however, the survey identifies how strategic they are in using these platforms and therefore whether their efforts are aligned with their business goals. Finally, the survey explores interruptions and the extent to which these platforms contribute to interruptions and diminish our ability to focus on important tasks. 1000 business professionals participated in the survey. The largest segment (49.7% of the participants) is from organizations with 1000 or more employees, followed by participants from organizations with less than 1000 employees (28% of the participants), and then independent consultants and contractors (22.3% of the participants). The participants represented a broad range of industries. In terms of their functional areas within the organization, professional services, administrative, and marketing were the largest segments, followed by top management, product development, and sales. In terms of the generations, Gen X and Baby Boomers were the largest segments. This report presents the key findings from the survey as well as the details of the survey results shown by generation, by personality type, by function, and by company size. Who is this survey report for? Executives who want to learn how their organizations use e-mail and Social Media and the potential impact on the top and bottom lines. Managers who want more information about how their teams are using these platforms so they can be more effective in guiding this effort. Human Resources professionals who want to better leverage these platforms and manage the legal risks associated with their use. IT professionals who want to optimize the tools used and minimize related security risks. Sales and Marketing professionals who want to leverage these platforms in their effort. Social Media practitioners who want additional insights and current data on the use of Social Media in the workplace. Myers Briggs® professionals who want information about how their audiences approach these technologies to address related issues with them. Trainers and coaches who want to be more effective in helping clients from different generations and personality types. Tools vendors who want to optimize their products and design new products to help business professionals enhance their use of e-mail and Social Media. Market analysts, reporters, and writers who watch trends, assess opportunities and challenges, and report on them. Join us at the Accomplishing More With Less Workshop in person, or virtually.